A new video has been added to the SHARE Training website! 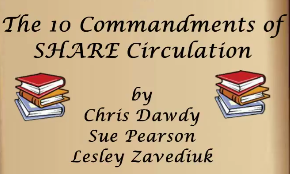 The 10 Commandments of Circulation course is required for current and future library staff. Accessing the course is easy! Click on the course link above and log in using your Polaris username and password. Once you’ve entered Moodle, self-enroll in the course and you’ll be able to view the video at any time. You’ll also find other courses including a Cloud Library Demo, Recorded Cataloger’s Training Sessions, and Basic Circulation.